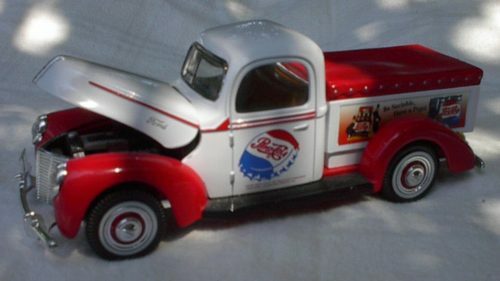 This is a very attractive modern reproduction of a 1940 Ford low bed Pepsi delivery truck. Rolls very smoothly on metal axles. The white spot on the running board is just glare. There are 2 minor blemishes, but no damage or signs of abuse. Should not effect it overall value or beauty. Composition: cast metal body, plastic fenders and rubber tires. Click numbers below to change image size on left.